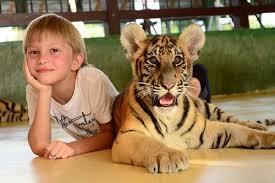 Tiger Kingdom is a new arrival on Phuket’s attractions scene. It allows you the opportunity to get up close and personal with several Indochinese tigers of varying ages and sizes that have been raised by hand in captivity since birth. Tiger Kingdom is an attractive, squeaky-clean setup located right next to the Go-Kart track in Kathu at the foot of Patong Hill. On four acres of land, it cost approximately 100 million baht to build.Tiger Kingdom is a new arrival on Phuket’s attractions scene. It allows you the opportunity to get up close and personal with several Indochinese tigers of varying ages and sizes that have been raised by hand in captivity since birth. Tiger Kingdom is an attractive, squeaky-clean setup located right next to the Go-Kart track in Kathu at the foot of Patong Hill. On four acres of land, it cost approximately 100 million baht to build.Stroll into reception and you’ll be greeted by a small army of orange-shirted greeters who will lead you through the paperwork necessary in meeting a big cat. For starters, you’ll need to sign a waiver exonerating Tiger Kingdom in case an accident happens, but this is standard procedure and you’ll have to do the same to bungy jump or to go on a zip line through the jungle.